International Contemporary Random Chess (ICRC) is a 10x10 variant inspired by English Random Chess and Contemporary Random Chess. 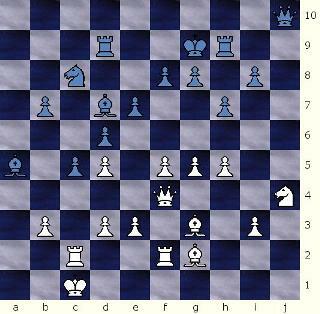 Benjamin Clark proposed English Random Chess in 2004. 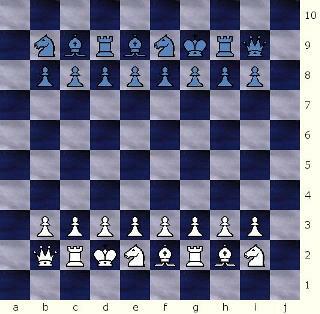 Simply stated English Random Chess is a variant played with the pieces of a standard chess set, on a Polish or International Draughts (Checkers) 10x10 board (below right). 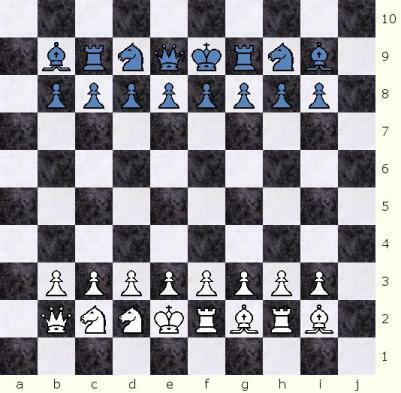 Contemporary Random Chess is a 'Modern' chess variant with a random setup (that allows both Bishops to start up on squares of the same color) and reverse symmetry between both armies. 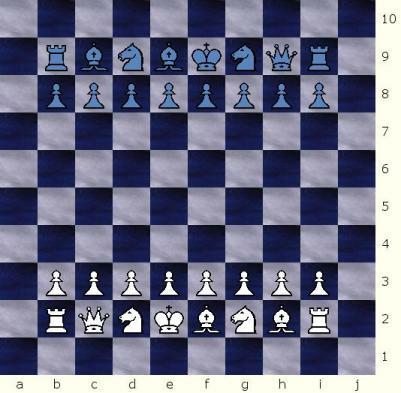 Contemporary Random Chess allows symmetric (short) castling to either side of the board, and the Bishop Adjustment Rule to allow players to move a Bishop to the opposite color squares in those random positions where both Bishops start on the same color squares. 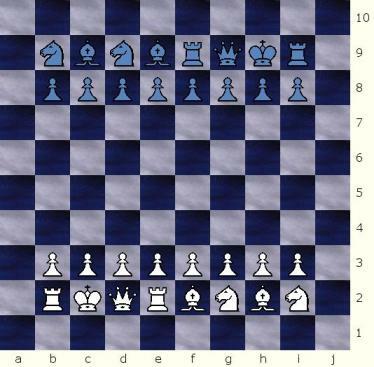 International Contemporary Random Chess applies all the 'Modern' principles to English Random Chess, limiting the opening setups to the 2,520 different reverse symmetric starting positions of Contemporary Random Chess, and formalizing a castling rule. ICRC also inherits the Bishops Adjustment Rule. 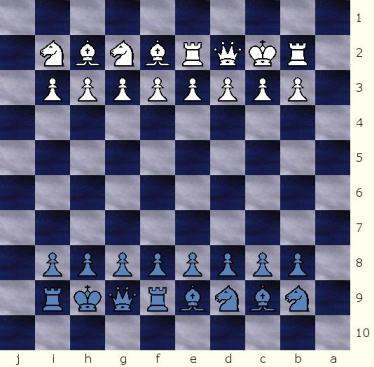 All pieces are randomly placed in the players' second rank, with the only restriction that the King must be between the two rooks (this is to allow for the castling rule). It is possible for both Bishops to be on the same color squares (dark or light squares). There are 2,520 different legal starting positions in International Contemporary Random Chess. 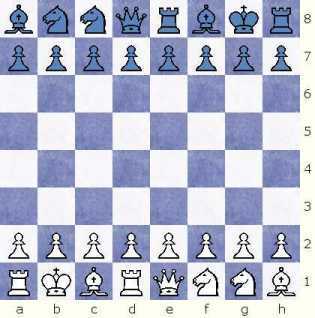 The International Contemporary Random Chess castling rules are based in the Fischer Random Chess rules. 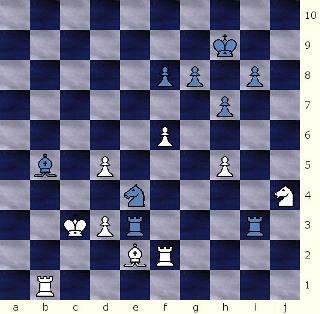 Castling the King and Rook will be placed as if the player had castled short in Orthodox Chess, both to either side of the board. There is no long castling (O-O-O) in ICRC. Castling in ICRC is symmetric to either side of the board. ICRC Castling is like the Orthodox short castling (O-O) but to either side. The First ICRC game ever! International Contemporary Random Chess (CRC) was created by JosÃ© Manuel Carrillo-MuÃ±iz, from Puerto Rico in 2008.